Here is another movie I have not seen in a very long time. I remember seeing this as a kid with my Uncle Earl. He was a huge Lee Marvin plan, and so I became one also. Marvin was a true manly man actor. He was a gifted soul of pure acting genius that gave everything to his characters in his vast film career. From action, to drama, to everything in-between. He had away with capturing a brutally honest, and emotional charged reality. 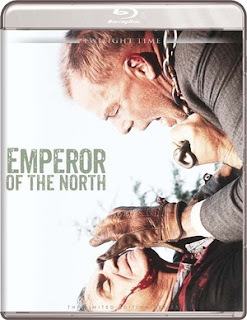 Emperor of the North is one of those films that his talent shines. Twilight Time did another fantastic job on an important product. Another top notch Blu-ray by an amazing company. Directed by an amazing director Robert Aldrich. Aldrich was a fantastic director that left us with so many wonderful films. He is one of those directors that created so many tough action films, or thick with emotional situations, and moments that would linger with you when the movie was over. He died at the young age of 65, but left many examples of films that I feel should be expressed, explored, and talked about amongst cinema lovers. From 1954’s Vera Cruz, to the awesome crime, Film-noir Kiss Me Deadly (1955). To me, his true shinning achievement, the one and only, 1962’s Whatever Happened to Baby Jane? The equally haunting, and personal favorite of mine, Hush Hush Sweet Charlotte. The amazing 1965’s Flight of the Phoenix, and the film many remember, 1967’s The Dirty Dozen. He was a director that had away with creating a story through his direction. A tight intense reality, sometimes dark, and morbid, other times action, and adventure, but always a great emotional tension. I think something that is asinine, is he never was nominated, or won an Academy Award, or Golden Globe, to me that is sad and ridiculous. Written by Christopher Knopf. Knopf executed a fantastic story that creates a memorable film. Knopf wrote a vast array of cinema and TV. He had his imagination and journey of storylines in many styles of film, but he was most famous for writing Television. From Zane Grey Theater, to Cimarron Strip, and many others. I will always know him from working on the script of the black and white sci-fi classic, 1957’s 20 Million Miles to Earth. I always remember anything Ray Harryhausen is involved with. He also wrote the 1960’s Audie Murphy film, Hell Bent for Leather, (that just makes me want to sing Judas Priest songs). The low down to the plot of this film is Lee Marvin is a HOBO named, A No.1. His goal is to ride the number 19 Train all the way to Portland, but the reality is, no one has ever ridden that train all the way. Why you ask? Because a brutal and mean conductor known as Shack, hates Hobo's, no one rides his train. He makes it a mission to stop A No.1. This is a blend of action, tension, and drama. Perfectly showcases a tight, tense yarn of unique storytelling, and amazing direction. Shack is played by the wonderful, flawless performer, Ernest Borgnine. Borgnine is a master talent that created so many wonderful characters throughout his career. The character of Shack is one of those performances that should be remembered, and expressed. There is a rich cast of actors in this film. From the amazing Keith Carradine, Matt Clark, Elisha Cook Jr., Simon Oakland, to the wonderfully talented Malcolm Atterbury. Another wonderful character actor Charles Tyner is in this film playing the part of Cracker. Tyner is always on the side lines, or playing a pivotal style character actors, but always is a face you know when you see him. Mainly a bad guy, or apart of the bad people, or a side line character that expresses a few lines, or even the weird person to warn about something. I will personally always remember him in one of my favorite Live Action mixed with animation films, Disney’s amazing 1977’s Pete’s Dragon as the character of Merle. Other key parts he has played in, is The Outlaw Josey Wales, Family Plot, Cool Hand Luke, Harold and Maude. He is always wonderful to see. Of the 7 actors I just mentioned starring in this film, have a combined acting experience of a total of 1,178 performances. Truly amazing. Another flawless reality to this movie is the amazing cinematography by Joseph F. Biroc. Biroc has a stunning eye, and crafted a wonderful example inside this film. Biroc started all the way back in 1929 with the film, The Rescue, and worked all the way up to 1989. He left the film world with a total excellence both great and small, from TV to feature film, his mastery gave the world of cinema a breathtaking art form. Working on such great films like 1946’s It’s a Wonderful Life, Blazing Saddles, Airplane!, to adventuring into Drive-In Late Night flare on the lines of B-movies, such as The Amazing Colossal Man, The Bat, 13 Ghosts, and many more. Emperor of the North is one of his amazing pictures that he left us with. Twilight Time choose an excellent film for this Special Edition 3,000 Unit Blu-ray. It's a film that sticks with you. Another wonderful example of a top product. The last time I saw this, it was on a VHS, and so comparing it to that, the VHS has no ground what so ever compared to this beauty. I never saw it on DVD, but trust me when I say, this Blu-ray is amazing video quality and audio quality. Listening bliss, and imagery solidly vibrant, stunning. An awesome transfer. Isolated Score Track. The music that was done for this movie was by the one of a kind musician Frank De Vol. He sadly is no-longer living, but he left many wonderful examples of his craft. He was nominated, and won Academy Awards. His brilliant ability has garnered such films as, Guess Who’s Coming to Dinner, Cat Ballou, Pillow Talk, and many others. He was a master of music. A pure composer, and even an actor. All one has to do is look at his composing for such films as the intense masterpiece, 1962’s Whatever Happened to Baby Jane, to Hush…Hush, Sweet Charlotte, The Dirty Dozen, and countless others, including TV series. He was a talented musician that stood out. Working from the early 50’s, all the way to the 90’s. He acted in many TV series from Get Smart, to Bonanza, I Dream of Jeannie, The Brady Bunch, and Diff’rent Strokes, The Jefferson’s, Charles in Charge, and many others. Something he is most famous for is supplying TV theme tunes, many of those very recognizable such as, The Brady Bunch theme, and My Three Sons. From acting, composing, and working in the music department, he was a talented soul that knew the art form of music. His talent would garner four Academy Award Nominations for his work. Audio Commentary with Film Historian Dana Polan. A wonderful listen. I have always stated I love to hear Film Historians talk about a film, and this one is no different, a great listen. Polan is truly a gifted lover of film. Booklet insert by Julia Kirgo. Another wonderful read. Now when going into this movie, one has to realize the simplistic tone, or lack of plot. The point was just that. The simple tone of the characters, or the lack of structure, in just who they are, or what they detail, is not the importance of the film. The main focus, and reality to the film is the overall actions, and personality of the characters. The point is, the plot is simple, yet created, and intensified by the personalities taking place. There is no grand written script about some deep thoughts. Its men, a train, and the action to complete, one equal brutality, and one equal of the goal facing that brutality. The brutish examples of male dominance, hatred, anger, control, power. The film expresses no grand understanding other than what the film details, a train ride, and two men in ultimate struggle, each wishing to obtain their goal. Twilight Time, owns and creates a perfection in their products. Emperor of the North is a must own Blu-ray. I highly recommend it.